Before :- J.C. Shah, J., V. Ramaswami, & G.K. Mitter, JJ. For the Appellants :- Vikram Chand Mahajan, R.N. Sachthey and S.P. Nayar, Advocates. For the Respondent :- Sardar Bahadur, Arun B. Saharya, Wishnu B. Saharya and Youginder Khushalani, Advocates. A. Punjab Civil Service (Executive Branch) Rules, Rule 23 - Confirmation - Probationer - Period of probation fixed at 18 months - Respondent had passed all the departmental examinations - Could not merely as a consequence thereof be considered to be holding a post substantively. B. Constitution of India, Article 311 - Probationer - Passing of departmental examination and lapse of probation period - Does not qualify a probationer for confirmation. Parshotam Lal Dhingra v. Union of India, 1958 A.I.R. (SC) 36 : 1958 SCR 828. Madan Gopal v. State of Punjab, 1963 A.I.R. (SC) 531 : 1963(3) SCR 716. State of Bihar v. Gopi Kishore Prasad, AIR 1960 SC 689. State of Orissa v. Ram Narayan Das, 1961 A.I.R. (SC) 177 : 1961(1) SCR 606. R.C. Lacy v. State of Bihar and other, Civil Appeal No. 590/1962 decided on 23.10.1963. Jagdish Mitter v. Union of India, AIR 1964 SC 449,. A.G. Benjamin v. Union of India, C.A. No. 1340/1966, decided on 13.12.1966. G.K. Mitter, J. - This appeal is by a certificate granted by the Punjab High Court under Article 133 of the Constitution against its judgment and order dated January 7, 1963 in Letters Patent Appeal No. 157 of 1959 reversing a decision of a single Judge of that Court who had dismissed a writ petition filed by the respondents on June 7, 1958 to declare that the order of the first appellant reverting him to his permanent post in the Delhi Administration was invalid and to quash the same. 2. The facts laid in the writ petition are as follows. The petitioner, Sukh Raj Bahadur, respondent herein was a permanent official of the office of the Chief Commissioner, Delhi. On December 9, 1952 he was accepted as a candidate for the post of Extra Assistant Commissioner on the Register A-II of the Punjab Government along with two others, on the advice of the Punjab Public Service Commission. He was posted as Inspector, Local Bodies, Jullundur Division and Assistant to Commissioner, Jullundur Division. Later on, he acted as Personal Assistant to the Deputy Commissioner, Amritsar. On being relieved from the Delhi State Government on January 15, 1953 he assumed charge of the post of Personal Assistant to the Deputy Commissioner, Amritsar in the P.C.S. (Executive Branch Cadre) on January 24, 1953. He passed all the departmental examinations prescribed under rule 236 21 of the Punjab Civil Service (Executive Branch) Rules, 1930. Under Rule 22 of the aforesaid rules, he was to remain on probation for a period of 18 months subject to his completing the training and subject to further extension of the period of probation as the case maybe. In his case, the period of probation expired in July 1954. The same was however not extended by any order of the Governor of Punjab. The petitioner claimed that under Rule 24 of the said rules he became qualified for substantive permanent appointment to the P.C.S. (Executive Branch). He received a charge sheet with a letter dated January 14, 1957 from the Secretary to the Government of Punjab, Anti-Corruption Department, asking him to reply to the charge sheet within a fortnight and to inform whether he would produce defence or whether he would like to be heard in person. The petitioner replied to the charge sheet on January 28, 1957 stating that he wanted an opportunity of being heard in person. By order of the Punjab State dated 23/26th May 1958 purporting to be one, under Rule 23 of the aforesaid rules, he was reverted by the Punjab State Government to his substantive post of Superintendent under the Chief Secretary, Delhi Administration with immediate effect. 3. According to the petitioner, the said order of 23/26th May 1958 terminated his service under the Punjab State Government and permanently removed him from the Punjab Civil Service. 4. The petitioner also complained that under Rule 9 of the Punjab Civil Services (Punishment and Appeal) Rules, 1952, he should have been apprised of the grounds to terminate his employment as probationer for any specific fault or on account of any unsatisfactory record or unfavourable reports implying his unsuitability for service and given an opportunity to show cause against the same before any orders were passed by the authority competent to terminate the appointment. The petitioner was never apprised of the rounds of any such proposal nor given an opportunity to show cause against it before the order reverting him to the post, of Superintendent mentioned above was made. There was thus a clear breach of Rule 23 of the Punjab Civil Service (Executive Branch) Rules. Accordingly the petitioner prayed that the said order of 23/26th May 1958 be quashed and suitable relief be given to him. "The Governor of Punjab is pleased to revert Shri Sukh Rai Bahadur, Extra Assistant Commissioner, officiating, from P.C.S. (Executive Branch) to the post of Superintendent under the Chief Secretary, Delhi Administration, with immediate effect." 6. In the written statement of the respondents to the petition it was stated that the impugned order was not a penalty calling for compliance with the provisions regarding penalty etc. and the Punjab Civil Services (Punishment and Appeal) Rules were not applicable. It was submitted that he was appointed to the Punjab Civil Service (Executive Branch) as a nominee of the Chief Commissioner, Delhi, who was one of the nominating authorities under Rule 8 of the Punjab Civil Service (Executive Branch) Rules, 1930 along with some of the officers of the Punjab Government. By passing the departmental examinations in November 1956, the petitioner was due for confirmation thereafter. The absence of confirmation implied that the probationary period was extended under Rule 22(c) of the Punjab Civil Service Rules. Lastly, it was said that the reversion of a probationer to his substantive rank could not amount to a punishment. 7. It is not necessary to examine the charges which were levelled against the petitioner in the charge sheet. Suffice it to say that they were all of a fairly serious nature. (1) On the expiry of the period of probation and on his passing the departmental examinations, the petitioner became qualified for substantive permanent appointment. (2) The impugned order in fact terminated his services under the Punjab State Government and removed him from the said service. The petitioner was not afforded any opportunity to show cause against the charges contained in the charge-sheet or against the proposed punishment. As such there was violation of the provisions of Article 311(2) of the Constitution. (3) The petitioner being a probationer, Rule 9 of the Punjab Civil Services (Punishment and Appeal) Rules, 1952 was applicable. The procedure prescribed by the rule was not followed although it was mandatory that before his employment as a probationer could be terminated, he should have been apprised of the grounds of the proposed termination and given an opportunity to show cause against it. 9. The learned single Judge held that the petitioner bad not acquired the status of a permanent member of the Punjab Civil Service merely by efflux of time and by reason of his having passed the departmental examinations. He further held that the petitioner continued only in an officiating capacity. The second point also was turned down by the learned Judge holding that the petitioner's case was one of reversion and not of termination of service as the petitioner was never appointed in a permanent capacity and was not visited with any evil consequences. In coming to this conclusion the learned single Judge relied on several decisions starting from the case of Parshotam Lal Dhingra v. Union of India, 1958 A.I.R. (SC) 36 : 1958 SCR 828. 10. The learned single Judge examined the third point at some length. It was urged before him that the petitioner did not fall within the definition of a 'probationer' in rule 2.49 of the Punjab Civil Service Rules, Volume 1, Part 1. On behalf of the petitioner, reference was made to the definition of 'Government' contained in Rule 2.24 of the Punjab Civil Service Rules and the definition of 4 cadre contained in Rule 29 and "it was submitted that if the petitioner had held a substantive post in a cadre under the Punjab Government and had been appointed on probation to another post, then the term 'probationer' would not have covered his case, but since the petitioner held a lien on a post in Delhi State and not under the Punjab Government, he could not be deemed to fall within the exception contained in the definition of a 'probationer' in Rule 2.49." Reference was made to a number of other rules on behalf of both the parties. 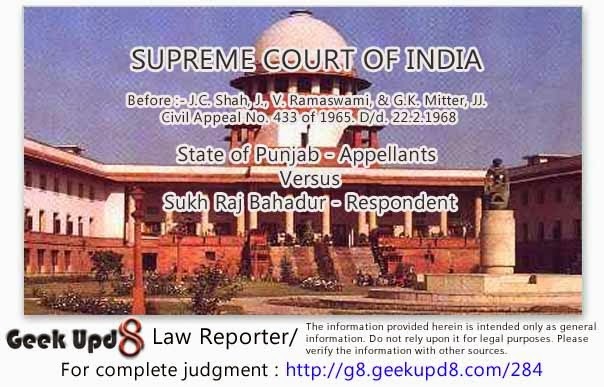 Ultimately, on examination of the respective contentions of the parties, the learned Judge concluded that the petitioner "could not be regarded as a probationer within the meaning of Rule 2.49 of the Punjab Civil Service Rules" and "he could not claim the benefit of Rule 9 of the Punjab Civil Services (Punishment and Appeal) Rules, 1952." He however did not think it necessary to decide whether in the presence of Rule 23 of the Punjab Civil Service Rules the Punishment and Appeal Rules would apply at all. Further, even if the said rule applied, the petitioner did not fall within the meaning of the word 'probationer' as given in rule 9. The learned Judge was of the view that there was force in the contention that Rule 9 of the Punishment and Appeal Rules could not cover the case of revision as Rule 9 only dealt with a case where it was proposed to terminate the employment of a probationer. In the result, he dismissed the application. "When the charge sheet was sent to the appellant (writ petitioner), the object and the intention of the State Government was to punish him either by way of dismissal or removal or reduction in rank..... Such an enquiry and any action consequent on such an enquiry would not be covered by principle of Rain Narayan Das's case, as laid down by the Supreme Court in Madan Gopal v. The State of Punjab & others (supra)." The Bench however observed that although no enquiry in the proper sense of the word had been held the omission to hold such an enquiry could not be made a ground for saying that the case differed in principle either from Gopi Kishore Prasad's(2) case or Madan Gopal's(1) case. Accordingly the conclusion reached was that "the reversion of the appellant was by way of punishment and amounted either to reduction in rank or removal from the P.C.S. (Executive Branch)" and as "these actions could not be taken without affording the appellant, adequate opportunity of showing cause against the punishment" there was violation of Article 311(2) of the Constitution. 12. We find ourselves unable to accept the reasoning or the conclusion arrived at by the learned Judges of the Division Bench of the Punjab High Court. It is not necessary to examine in detail the earlier decisions of this Court which bear on the issue before us. In this case, the respondent did not cease to be a probationer at the time when the impugned order was passed on him. Although the period of probation was fixed at 18 months and although the respondent had passed all the departmental examinations, he could not merely, as a consequence thereof, be considered to be holding a post substantively. Apart from the question as to the right of the respondent under the Punjab Civil Service Rules, the respondent could not complain merely because he had been reverted to the post formerly held by him. He would have cause to complain if he could show that the order of reversion was by way of punishment. As was pointed out in Parshotam Lal Dhingra's (3) case. "The mere fact that the servant has no title to the post or the rank and the Government has, by contract, express or implied, or under the rules, the right to reduce him to a lower post does not mean that an order of reduction of a servant to a lower post or rank cannot in any circumstances be a punishment. The real test for determining whether the reduction in such cases is or is not by way of punishment is to find out if the order for the reduction also visits the servant with any penal consequences.........the court has to apply the two tests mentioned above, namely, (1) whether the servant had a right to the post or the rank or (2) whether he has been visited with evil consequences of the kind hereinbefore referred to ? If the case satisfies either of the two tests then it must be held that the servant has been punished and the termination of his service must be taken as a dismissal or removal from service............."
"...... the fact of the holding of an enquiry is not decisive of the question. What is decisive is whether the order is by way of punishment in the light of the tests laid down in Parshotam Lal Dhingra's (3)." In the result the appeal of the State was allowed. "the enquiry which was held by the Commissioner in this case was in the nature of a preliminary enquiry to enable the Government to decide whether disciplinary action should be taken against the appellant...... It is clear however that the Government did not decide to hold any enquiry for the purpose of taking disciplinary action against the appellant, for no enquiry officer was appointed, no charges were framed and no regular departmental enquiry as envisaged by the rules and Article 311(2) of the Constitution Was ever held." According to this Court the action of the Government was in pursuance of its right to revert an officer holding, a higher post temporarily if he was not found fit for the purpose. "Such an enquiry and order consequent upon the report made in the enquiry will not fall within the principle of Ram Narayan Das's(1) case." In the result, the appeal was allowed. "a acting bonafide in that behalf, the authority may also give a chance to the servant to explain, if any complaints are made against him, or his competence, or suitability is disputed on some grounds arising from the discharge of his work; but such an enquiry would be held only for the purpose of deciding whether the temporary servant should be Continued or not. There is no element of punitive proceedings in such an enquiry; the idea in holding such an enquiry is not to punish the temporary servant but just to decide whether he deserves to be continued in service or not............... in some cases, the authority may choose to exercise its power to dismiss a temporary servant and that would necessitate a formal departmental enquiry in that behalf. If such a formal enquiry is held, and an order terminating the services of a temporary servant is passed as a result of the finding recorded in the said enquiry, prima facie the termination would amount to the dismissal of the temporary servant." The Court however was careful to add that considerations of the motive operating in the mind of the authority had to be eliminated in determining the character of the termination of service of a temporary servant and that the form in which the order terminating his services was expressed would not also be decisive. If a formal departmental enquiry had been held in which findings were recorded against the temporary servant and as a result of the said findings, his services were terminated, the fact that the order by which his services were terminated, ostensibly purported to be a mere order of discharge would not disguise the fact that in substance and in law the discharge in question amounted to the dismissal of the temporary servant. The order of discharge of the appellant ran as follows : "Shri Jagdish Mitter, a temporary Second Division Clerk of this office, having been found undesirable to be retained in Government service is hereby served with a months notice of discharge with effect from November 1, 1949." According to this Court, the order cast an aspersion on the temporary servant and in substance it amounted to an order of dismissal. The last decision to which we may refer is the one in A.G. Benjamin v. Union of India, C.A. No. 1340/1966, decided on 13.12.1966. In this case, the appellant was temporarily employed as Stores Officer in the Central Tractor Organisation. As he was not a confirmed government servant, his services could be terminated under Rule 5 of the Central Civil Service (Temporary Service) Rules, 1949 with one month's notice on either side. The services of the appellant were terminated on April 23, 1954. There had been certain complaints against him in respect whereof the Chairman of the Central Tractor Organisation sent a notice to him asking him to show cause why disciplinary action should not be taken against him and an Enquiry Officer was appointed, but before the enquiry could be completed, the Chairman recommended that the services of the appellant should be terminated under Rule 5 observing in his note to the Secretary that : "The departmental proceedings will take a much longer time and we are not sure whether after going through all the formalities we will be able to deal with the accused in the way he deserves." Acting upon this suggestion the appellant was served with the order complained of. The order was to the effect that the appellant was being informed that his services were no longer required in the organisation and the same were terminated with effect from the date on which the notice was served on him. He was further informed that in lieu of the notice one month's pay and allowances due to him, he would be given the same for that period. This Court distinguished the facts in this case from those in Madan Gopal's (2) case and held that the principle of that case could not be applicable. 1. The services of a temporary servant or a probationer can be terminated under the rules of his employment and such termination without anything more would not attract the operation of Article 31 1 of the Constitution. 2. The circumstances preceding or attendant on the order of termination of service have to be examined in each case, the motive behind it being immaterial. 3. If the order visits the public servant with any evil consequences or casts an aspersion against his character or integrity, it must be considered to be one by way of punishment, no matter whether he was a mere probationer or a temporary servant. 4. An order of termination of service in unexceptionable form preceded by an enquiry launched by the superior authorities only to ascertain whether the public servant should be retained in service, does not attract the operation of Article 311 of the Constitution. 5. If there be a full-scale departmental enquiry envisaged Article 311 i.e. an Enquiry Officer is appointed, a charge sheet submitted, explanation called for and considered, any order of termination of service made thereafter will attract the operation of the said article. 17. In this case the departmental enquiry did not proceed beyond the stage of submission of a charge sheet followed by the respondent's explanation thereto. The enquiry was not proceeded with, there were no sittings of any Enquiry Officer, no evidence recorded and no conclusion arrived at on the enquiry. In these circumstances, the principle in Madan Gopal's(1) case or Jagdish Mitter's (2) case will not be applicable. The case is in line with the decisions of this Court in State of Orissa v. Ram Narain Das (supra). R.C. Lacy v. The State of Bihar (supra) and A.G. Benjamin v. Union of India (supra). 18. In this view of the matter, we are unable to concur with the opinion of the Division Bench of the Punjab High Court. 19. This does not however conclude the matter. The respondent also complained against the non-observance of the Punjab Civil Services (Punishment and Appeal) Rules. The learned single Judge of the Punjab High Court does not appear to have expressed himself definitely on the third point canvassed before him although he observed that the contention of the Advocate General about the inapplicability of Rule 9 was not without force. The learned Judges of the Division Bench did not consider this question at all. We, therefore, allow the appeal and set aside the judgment of the Punjab High Court and remand the matter to that court for consideration of the respective contentions of the parties based on Punjab Civil Services (Punishment and Appeal) Rules, 1952. The costs of this appeal will abide by the decision of the High Court. Appeal allowed and case remanded.